In simple terms "cloud computing" means accessing the database resources via internet.the best examples are Google applications,Facebook,etc..,let me explain in clearly if you're searching an article in Google search it will retrieve the necessary information from their databases via internet this is called cloud computing.At the same time if you post an article in Facebook it will be store the data in their databases via internet this is also called "cloud computing". 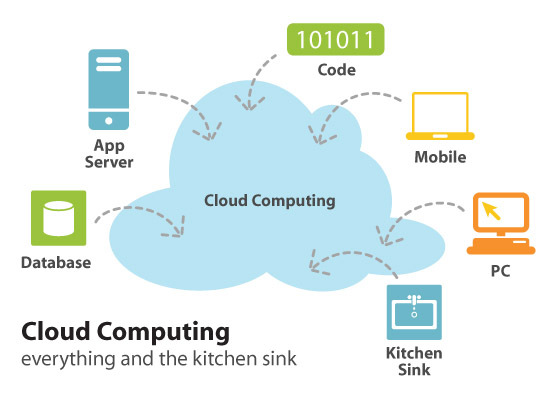 1)By using cloud computing we can store large amount of data from anywhere without worrying about their maintenance. 3)if we are using the Cloud computing for our aspnet application,there is no change in the performance in our aspnet application if traffic raises high. 4)Thousands of virtual machines and applications can be managed more easily using a cloud-like environment. There are three types of cloud computing - public cloud, private cloud and hybrid cloud. Public cloud- this is considered as a main-stream cloud system by cloud computing experts and it is most popular also. In public cloud system ,A third party data center provide both disk space and computing power for all the application software. Google apps and Amazon web is the two most popular public cloud computing service providers. Private cloud- Private cloud is different from public cloud, Here we need to set up our own data center and also bear all the installation & maintenance cost, and at the same time we have complete control of all our data. when compared to Public cloud this system provides more security and privacy, but it is more expensive cloud solution to public cloud. one is Front end and another one is Backend. The front end is the interface for the user example client and the back end is the cloud section for the whole system. Front end and Backend connected with each other via network like internet. This service provider bears all the cost of servers, networking equipment, storage, and back-ups.Rather than purchasing servers, software, data-center space or network equipment, clients instead buy those resources as a fully outsourced service. This service provider will give your users the service of using their software, especially any type of applications software.Google Apps., Salesforce.com,and various other online applications are use cloud computing as Software-As-Service (SAAS) model. Platform cloud services are used by software developers to build new applications and by operations managers to manage their application, compute and storage cloud services. Asha is an Engineering student at JNTU university from India.She loves to blog about SEO, Blogging Tricks, Software and anything related to Technology.